Here is my final harvest of green tomatoes that were picked October 19, 2014. I picked all my green tomatoes and kept them after my garden was pulled before the frost hit. I had a whole bag of green tomatoes that I wrapped in newspaper and stored in a large brown paper bag in my basement. 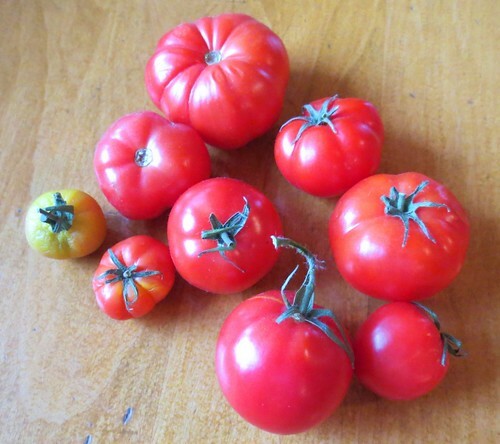 I have used this process in the past and you can read the original storing green tomatoes post which works excellent for storing and ripening all those green tomatoes you have at the end of your gardening season. You just keep checking the tomatoes and pull them out as they ripen from the storage brown bag. This is the last of my tomatoes and as you can see, just one is still yellow. So if you are looking for a way to save all those green tomatoes for future eating, I hope you will try this useful idea. Yes even I follow this technique to ripen any kind of fruit. It really works and is a very natural way.